Dr Leigh Vial will be returning to Savannakhet, Laos this month to re-visit the communities and farming families who received the ten crowdfunded drill seeders supplied in early 2017. Leigh, who last reported in June 2017 will assess the progress and impacts of the drill seeder project and enable further training and distribution of upgraded attachments. Reports after the initial visit in 2017 discovered that an unusually early rains prevented planting with the seeder as the fields were too wet. In addition to this, drill points were positioning the seeds too deep in soft, freshly-tilled sandy soil. Despite these issues, famers reported being happy with the performance of the seeders and have developed solutions to the seeders planting too deep in some soil types. On this return trip, I will be assessing the progress of the seeder program by engaging with farmers, the community and PAFO. I also want to gauge progress of farming with the seeders, answer questions and discuss the problems that have arisen, and any solutions implemented. In addition to this, new training will be provided to farmers in calibrating fertiliser metering mechanisms and developing hands on practice with drill seeding maize and legumes. 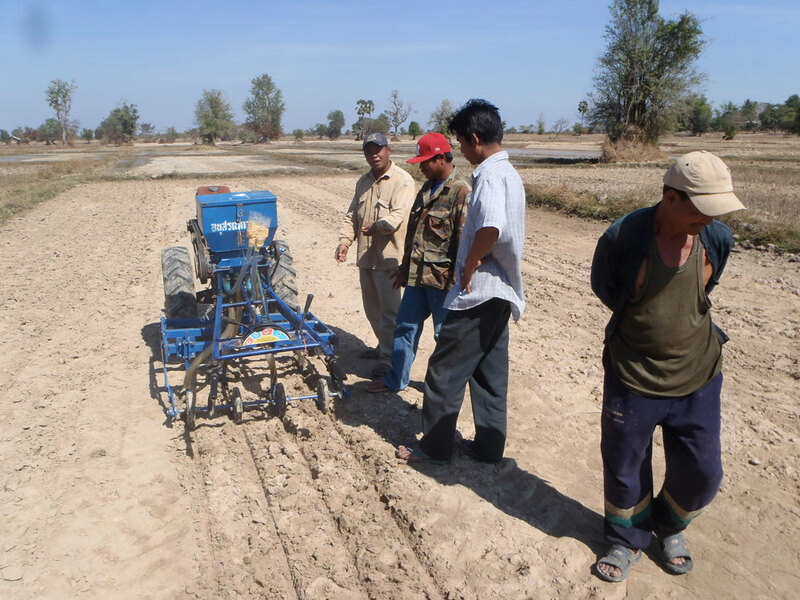 The seeding machines supplied to these farmers are the only ones in Laos that allow for the planting of maize and legume crops. These crops are essential cash-crops for farmers, and by using the seeder, farmers will see an increase in their livelihood. Finally, I will supply farmers with new points for their seeders. Distribution of 5-inch, 6-inch and 9-inch points will enable farmers to cultivate when they seed and cultivate between the seed rows later in the season for weed control. I find it a delicious irony to be facilitating inter-row cultivation, as some Australian systems are veering back to it after hitting serious herbicide resistance problems. I’ve been invited to attend and partially facilitate a drill-seeding workshop in the Outomphone District. This workshop will be enjoyable and very beneficial, I hope to amplify the voices of farmers on their experience with using the drill seeder for their rice crops. We will be reporting on Leigh’s visit while he’s in Laos so follow us on @crawfordfund and on FB.